Your kiddo has become quite the history buff, hasn’t he? There sure are a lot of people throughout the history of the United States to look up too, but one of our favorite historic icons would have to be Theodore Roosevelt! He was a Rough Rider, one of the most celebrated presidents, and even has his face carved into the side of a cliff alongside other American heroes. Not to mention everybody’s original cuddle buddy, the Teddy Bear is named after President Roosevelt! If all that doesn’t make a guy role model material, we have no clue what would! Everything depicted in this picture other than the toy rifle and satchel is included with this costume. As soon as your little one secures this bush jacket and pulls up these presidential slacks, he’ll look like a real rough rider himself! The easy-stick mustache and wire-rimmed glasses will have your kiddo looking exactly like ole Teddy. Before you know it, your youngster will be working on novels and making plans to open up new national parks all around the United States. Roosevelt was always a very ambitious man and you can bet your bottom dollar that if your little one is looking up to this historic figure, plenty of grit and determination will fill his soul. 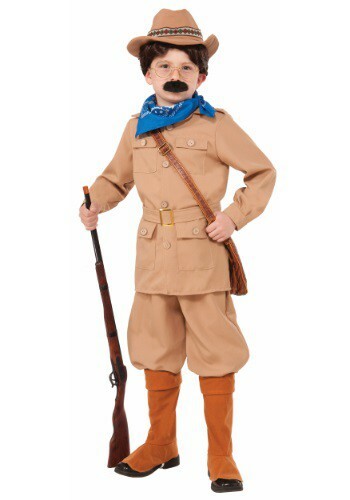 Grab this Theodore Roosevelt Costume for your kiddo and let his history-fueled Halloween adventure begin. The real Teddy may have not actually ridden a moose but with enough gumption and can-do attitude, we believe that your little one can accomplish something that even the famed president never did!